The Snake River Connection — located in the beautiful rolling sand hills of Western Nebraska — is pleased to offer a limited number of opportunities for big game hunting. We currently have a 2020 openings. If you are looking for a quality trophy deer hunt, you’ve found it. 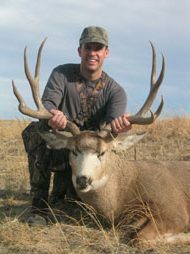 The Snake River Connection is on the 14,500 acre Sasse-Vinton Inc. Ranch and offers whitetail and mule deer ample space to flourish. The Snake River meanders through 7 miles of the ranch offering deer a source for water and providing space for grazing along the banks of the river. The rough sand hills are excellent for spot and stalk hunts. The Snake River Connection is run by the Sasse Family, and are the owners of the Sasse-Vinton Inc. Ranch. Agnes Sasse and two of her sons, Bob and Pat with their families, live and work year round on the ranch. The ranch has been a family owned operation since 1927. Ranching and wildlife conservation has been a family priority for almost 95 years. Bob and Pat — along with their brother Ted, and nephews Aaron, Tim along with Jeff — are all excellent guides and knowledgeable hunters. All of guides grew up on and around the ranch and know the favored locations for pursuing trophy deer. We take pride in providing individual service and will be happy to accommodate your hunting needs. Welcome to the new web site for Snake River Connection.